Is Miss Evelyn Parker being taken for a ride? Miss Parker, a teacher at Woods Foundation School. Billy the Pig - A curious tale! Most people have a pet of some kind. Often one hears of the sagacity of dogs, of amazing travels of cats when transferred from their homes, of talking budgerigars, even of pet geese, but seldom, if ever, of a pet pig. This is one of those true stories which are stranger than fiction. It concerns Billy, the pet pig of Mrs K. Foster, the postmistress of the delightful little Notts village of Woodborough. Billy is now nearly six months old. He emulates the characteristics of a dog, probably because he has been brought up in close association with one, roams about the village unattended, knows his way home, has morning calls at feeding centres, and is loved by all and sundry. He never seems to be in any trouble with the traffic on the roads, nor runs the slightest risk of ending his days in a slaughterhouse, which he occasionally visits. And this despite the need of the local butcher, in the present emergency, for an extra ration of pork for his customers. This curious pet came into existence as one of a litter, belonging to the village blacksmith. The mother was taken ill soon after their birth, and she could not attend to the feeding of her offspring. Fearing the complete destruction of the young pigs, the owner decided to distribute them among his friends. Billy was the delicate one of the family, and when the blacksmith made a present of him to the postmistress he was convinced that it would be impossible for the animal to survive. A patent milk diet and a warm bed close to the fire, with part of the hearth as his bed, did the trick. Billy gained in strength and size, but then came trouble. It was some time before he could satisfactorily settle differences with the dog of the house. This difficulty surmounted he began to imitate the dog, developed a "woof" instead of a grunt, and made sure that he received an equal ration of dog biscuits. He liked the flavour so much that he soon learned the dog's habit of begging. Soon came the time when he ventured out of the house, and it was not long before he found the butcher's shop two or three doors away. He nosed his way in the shop, waited for scraps of fat, and then departed and sought more food at the slaughterhouse. This has now become a daily habit. "In all the years I have been a butcher", said Mr Parker to a "Post" representative, "I have never known a pig act in such a manner. He will not leave the shop without some fat and when I tell him to go home, he obeys". Some months ago a few soldiers went to the village. They did not stay long, but the time was sufficient to endear Billy to them. 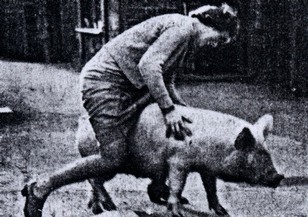 Some of them, including officers, could often be seen carrying the young pig about the village and it was with genuine regret, when they departed, that they were unable to take him as a mascot. Billy misses them greatly. He has lost a lucrative food centre, for now, on his daily tours of the old cookhouse, he finds the cupboard is bare.